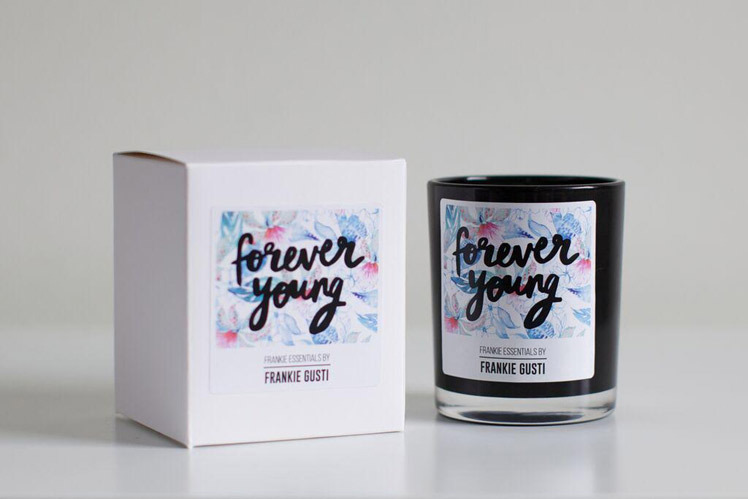 Inspired by a simple handmade candle from her own Mum, Gen, of Frankie Gusti, started her hand poured soy candle business, allowing for flexible working hours while caring for her own babies. Read on to discover more about this Yarra Valley based label. Tell us a bit about Frankie Gusti and what we can expect to discover? 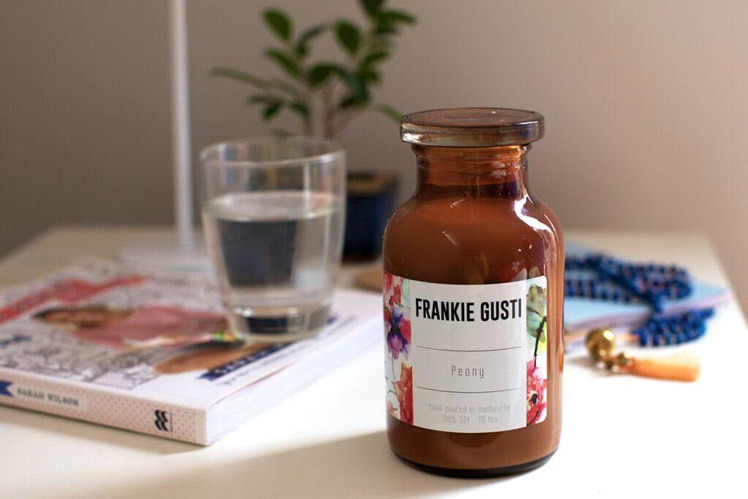 Frankie Gusti is a soy candle label that creates quality 100% soy candles hand poured in my Yarra Valley home studio. You will find something for everyone with three beautiful and unique collections, designed to impress all senses and budgets. 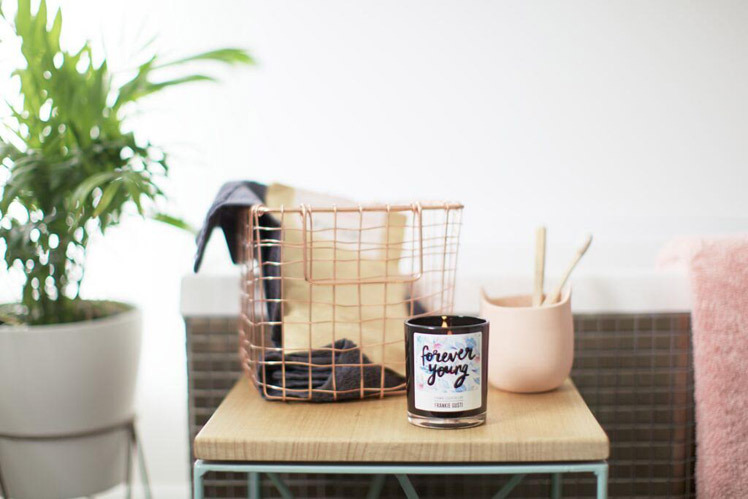 Our vessels vary between amber, black and clear, you can choose from wood lid or apothecary style jars, and our fragrances include fresh, fruity, warm, sweet and masculine. 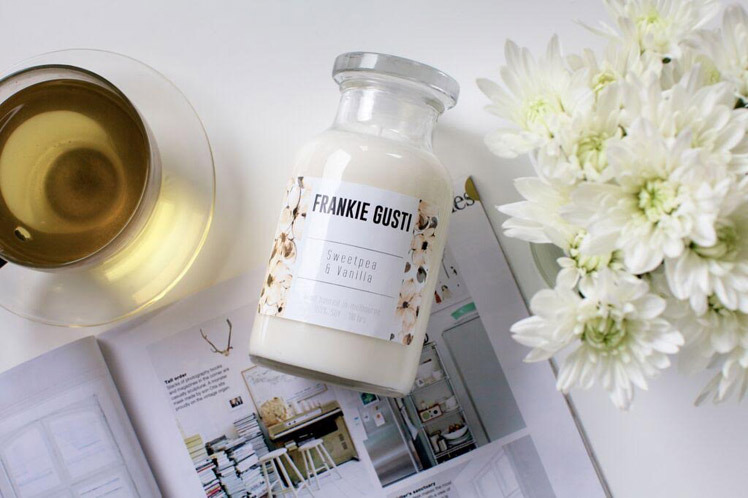 We also offer our Frankie Essentials which are expertly blended with pure Essential Oils, to ensure perfect therapy for the mind, body and soul. Frankie is colourful, fun, versatile, welcoming, and perfect for scenting any space. What is your background and how did you start working with candles? My customers and supporters constantly keep me motivated. 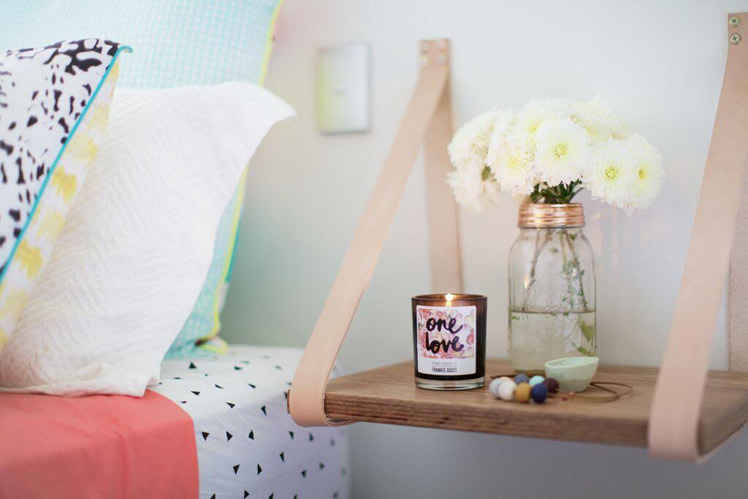 I love hearing their feedback and how they connect to a particular scent as it reminds them of their late Grandma’s house or that it evokes memories of travelling to faraway destinations. I love creating new products too. It keeps me fresh and keeps customers excited for something new. I’m inspired by the seasons and nature. By trending patterns and designs. If my labels aren’t a giveaway…I LOVE watercolour. Organised Chaos! I’m lucky that we have the space at home to have a studio, which means my work hours can be flexible around my babes. But, it’s chaotic. I just had a delivery of 2,500 jars and 230kg of wax (!! ), so I think we may look at renting a commercial space for me to work from next year. Frankie Gusti is growing and my space will need to also! I have 1 official workday without the kids, so my Mum works with me then and one evening a week to help me get through orders. 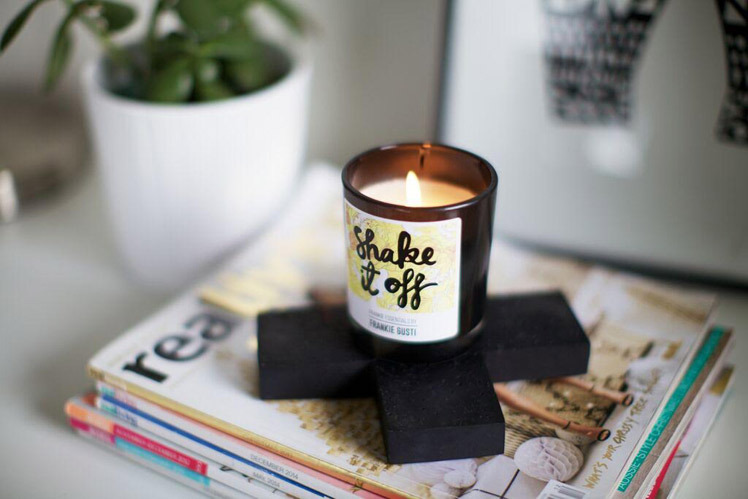 This includes prepping jars, heating wax, adding fragrance, pouring, letting the candles cure, labelling, packaging, shipping off. My favourite part is creating new blends, working with my graphic designers to create new labels and designs. Our sense of smell is such a personal thing and I love creating and sampling scents that I know others will fall in love with too. There are also days when nothing goes to plan- like when my child eats a pack of our soy melts, or it’s too cold in this Melbourne weather to pour in my studio so I have to make a pouring station in my dining room! In the early days I struggled a lot with being an amateur business when I had HUGE dreams for Frankie Gusti, so was easily deflated when I compared myself to other successful labels. But now, I see those goals coming to fruition and I’m happy and confident in my products and concepts. Another issue I’ve unfortunately come across is ‘Creative Theft’. I’ve been a victim of it and I see it way too often on social media sites. I love, LOVE, that I have flexible working hours that allow me to be a hands on Mama to my babes, Rafe (almost 4) and Ivy (2). I love seeing people enjoy something as much as I enjoyed creating it! What new plans do you have for Frankie Gusti this year? With our Frankie Essentials collection launching earlier this year and our Little Honeys collection launching online next month, I plan to focus on networking and collaborating with other brands and artists to bring you some new and exciting products.